The Japan HR Society (JHRS) - The JHRS Annual Shin Nen Kai 2015: STRONGER. BOLDER. BETTER. The JHRS Annual Shin Nen Kai 2015: STRONGER. BOLDER. BETTER. * Applicable to Basic or Associate JHRS Members and the General Public. Tax included in the event fees. * Applicable to JHRS Professional or Corporate Members and Community Officers & Partners. Tax included. Now on its 8th Year, the JHRS Shin Nen Kai is an ideal opportunity for you to network, connect, and make new friends and acquaintances not only with your HR peers but other business professionals as well. Who knows the new relationship you might develop in this event may serve you well in the coming year! ENJOY the sumptuous food and drinks that only our host, The Landmark Square Tokyo, can deliver! Join us for our kampai toast and eat and drink all you can for two hours! * Raffle tickets sold separately during the event. Read Raffle Terms & Conditions. All proceeds of the raffle tickets shall go to fund the various projects and programs of JHRS in 2015. And that's not all! We will end the night with a Group Dance to the tune of Kelly Clarkson's smash hit song "What Doesn't Kill You (Makes You Stronger)." So prepare your dancing shoes and join the fun to make this Shin Nen Kai as the most fun ever to date! Watch this video for the dance choreography (dance steps). It's really easy and should be FUN! You'll be glad and energized when you join this Group Dance! If you are having trouble accessing YouTube, download the video here. Thanks to our generous sponsors and supporters, JHRS is able to offer participants the following discounted rates!!! 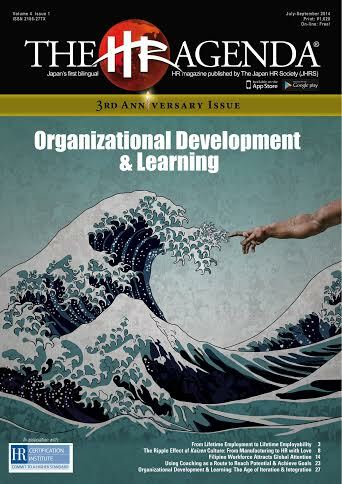 Get FREE print copies of The HR Agenda's Organizational Development & Learning issue. RSVP: Please register on or before January 27, 2015. Doors open at 18:30. *To upgrade to Professional Membership, simply log-in to your JHRS account, go to "View Profile," click the "Change Membership Level" button, and follow the on-screen instructions. Enter Discount Code: UPGRADE2015 to receive discount (applied during payment process). Save 20% Become a new JHRS Paid Member (Professional or Corporate) by 31 January 2015 and get 20% from the normal annual membership fees. JHRS Paid Memberships has their privileges. Learn them here. "Thank you very much for the Shinenkai tonight. I think that it was a resounding success. Best of luck to everyone for 2014! I want to help to make JHRS stronger. Be HR. Be Relevant."---V.B. "It was a pleasure to meet everyone tonight!"---D.M. "Congratulations on JHRS' 6th Annual Shin Nen Kai! Not many HR groups in Japan even pass 3 years in existence but JHRS has gone beyond that and continuing to grow and making an impact in Japan HR. Thank you all for all your hardwork. I only attend few events in a year but I make sure JHRS Shin Nen Kai is one of them. Again, thanks for a lovely night!" ---J.S. "We go to Legato during lunch time but this is the first time I went here at night and it is lively! Good choice of venue and the food is delicious" ---A.H.
"Thank you for invitation to attend last Friday night. I enjoyed good tasting dishes and I was able to meet a lot of nice persons. Thank you for giving me a chance."---R.S. "Thank you for putting on a great Shinnenkai; I really enjoyed it. I look forward to attending future JHRS events."---J.L. "It was a really good night with great people. Congratulations. JHRS really did give away some nice things. Great night!"---D.M. "I was very impressed with the event, a good group of people for sure." ---J.S.